Total length of the toy: 8 1/2" x 3" wideClear high impact polycarbonate plastic ball is 3" in diameter. Both halves sit securely on the skewer when screwed into the base. Simply unscrew from the base to remove top half to refill.Has five 3/8" x 1 1/4" slots through which your bird may retrieve the items inside. 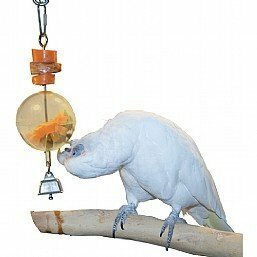 For large and medium birds.Note: Image shows skewer with carrots on top of acrylic ball. My peach faced lovebird hen absolutely loves this toy! It's particularly handy for Nutriberries and other treats, though she also enjoys when I stuff it full of leafy greens, paper or wooden blocks. She'll work for a good 30 minutes on this toy alone, which is pretty impressive for a bird with her short attention span. It washes up really easy, which I really like. I've had it about three years, which makes it the longest lasting bird toy we've owned. The Foraging Sphere is my hands-down favourite toy purchase yet. I love this foraging toy!! My amazon didn't figure out how to get the food out from the inside on the first day. The next day I put half a plum (no seed) through the bar, on top of the sphere, and that's when he realized there is food involved. He now enjoys it in the morning! You do have to be quite dextrous with your hands to be able to hold the ball shut, keep the food on the bar, and attach the pieces, but I think it's well made and I'm happy with it. Haven't tried this yet but it looks fine. Q: What type of metal is this toy made of? 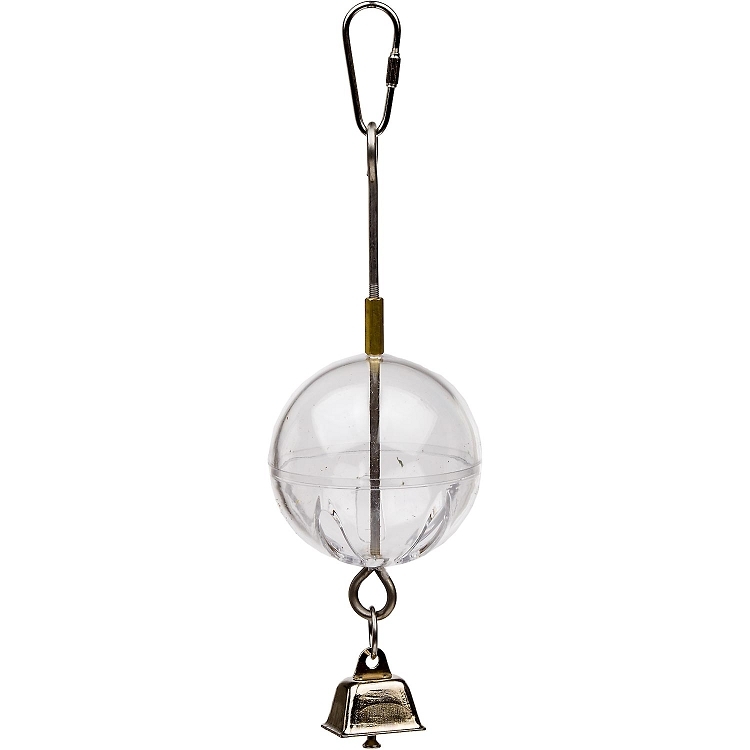 The skewer and the bell? A: Rod appears to be stainless, pear link and bell are not -- most likely nickel.